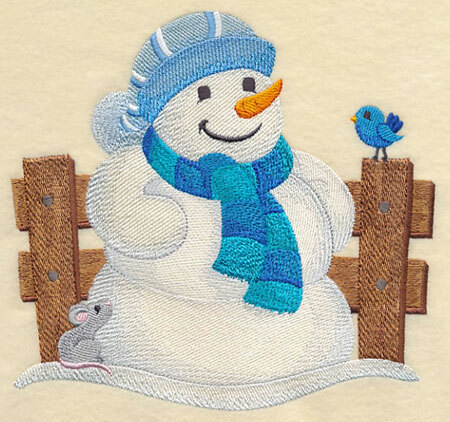 A friendly snowman celebrates the wintry season with his woodland friends in this too-cute design. 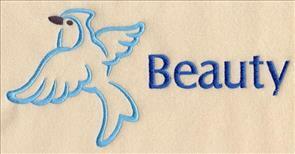 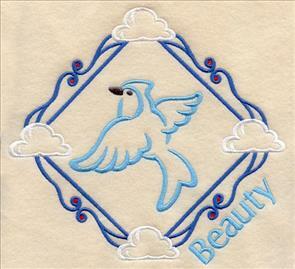 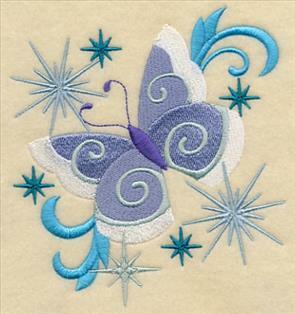 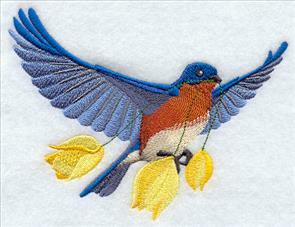 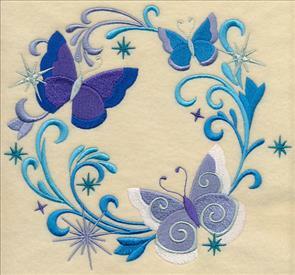 It's a terrific way to adorn pillows, tote bags, wall hangings, and more! 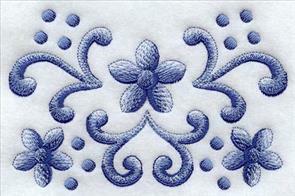 7.34" x 6.90" and 6.24" x 5.86" and 5.17" x 4.86"
Traditional Scandinavian artwork is well-known for its use of intricate detail and stunning symmetry. 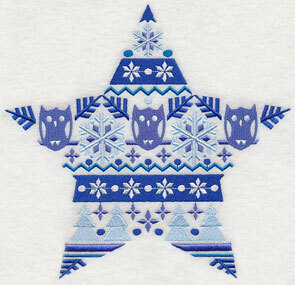 These true-blue versions feature snowflakes, trees, and other natural elements for even more eye-catching interest. 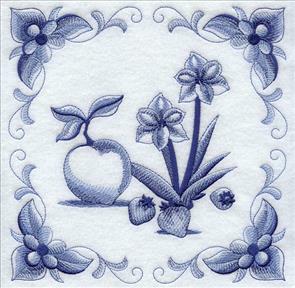 7.80" x 7.49" and 7.20" x 6.91"
6.77" x 7.81" and 6.34" x 7.31"
5.73" x 6.61" and 4.86" x 5.61"
Each of the Nordic-inspired designs come in a classic winter shape and are a unique way to stitch for the season. 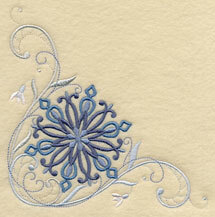 Varying shades of blue keep the cool theme alive while adding layers of depth and texture. 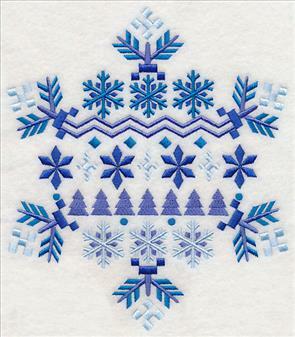 7.71" x 6.88" and 7.16" x 6.39"
7.81" x 7.39" and 7.01" x 6.64"
6.13" x 5.81" and 5.14" x 4.87"
Alongside the natural winter elements inside these designs are geometric shapes, another traditional aspect of classic Nordic artwork. 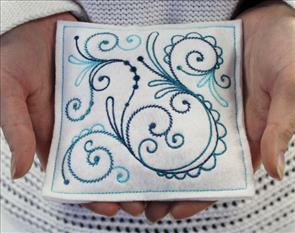 Stitch the series on pillows, placemats, or on a quilt! 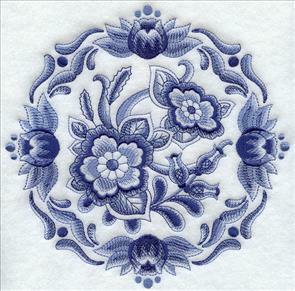 7.77" x 7.81" and 6.90" x 6.94"
7.81" x 7.79" and 6.93" x 6.91"
5.83" x 5.81" and 4.86" x 4.85"
These designs are a beautiful way to adorn your embroidery projects for winter. 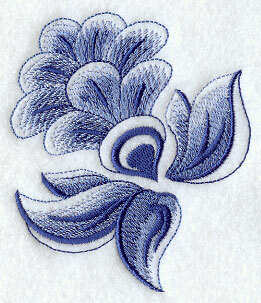 Four sizes are available to suit any project. 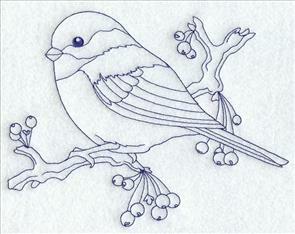 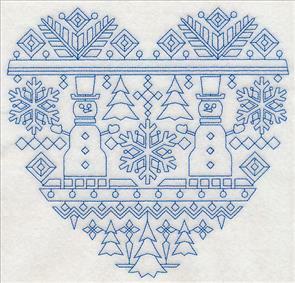 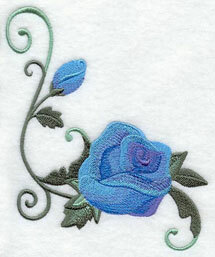 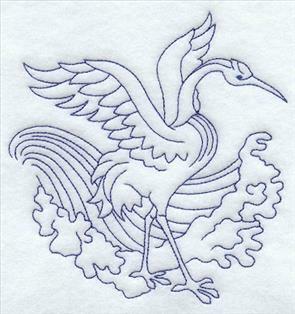 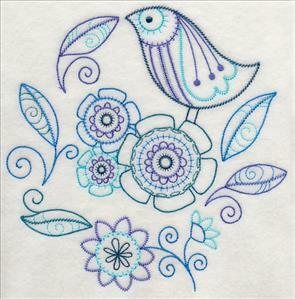 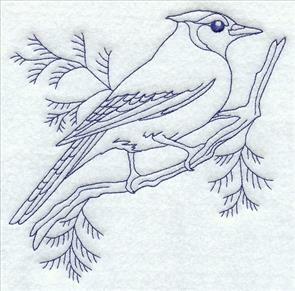 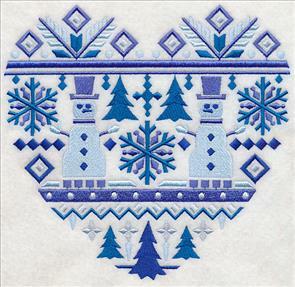 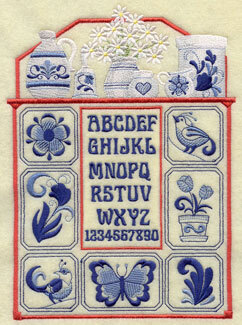 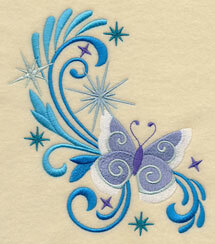 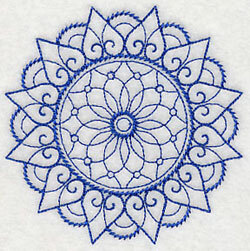 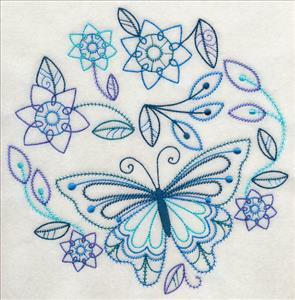 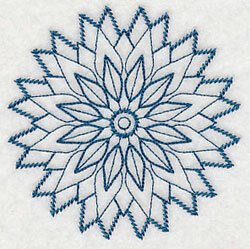 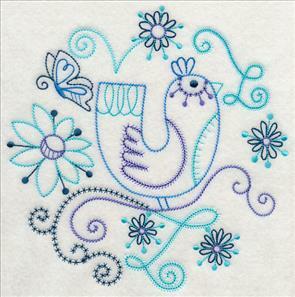 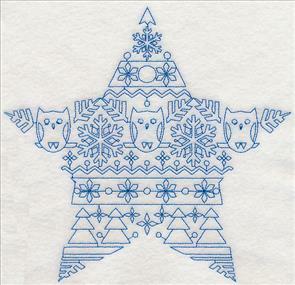 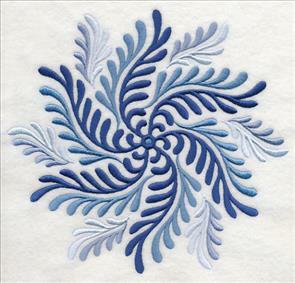 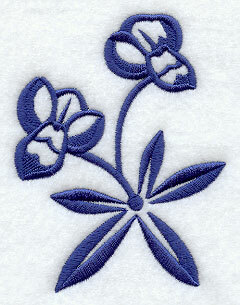 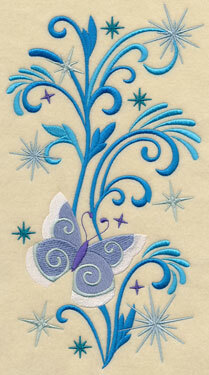 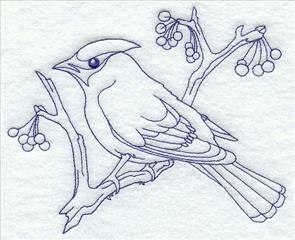 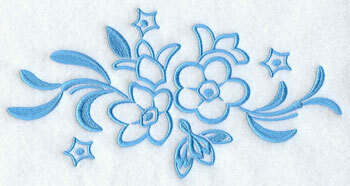 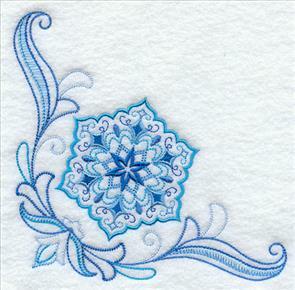 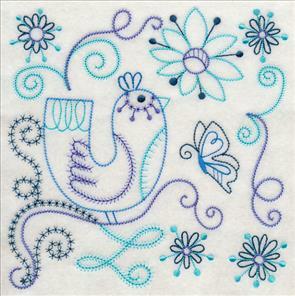 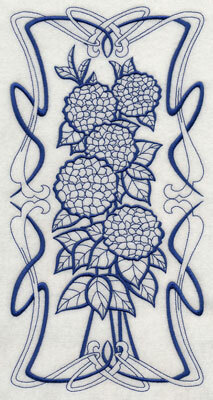 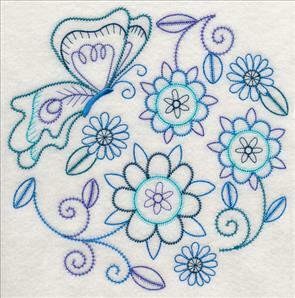 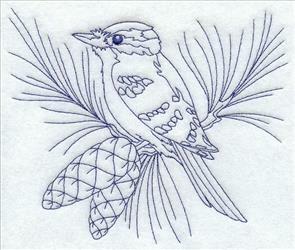 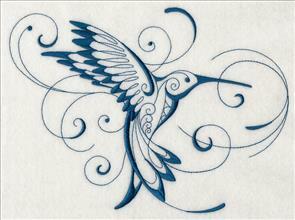 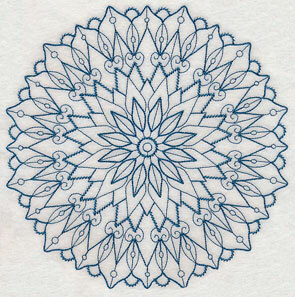 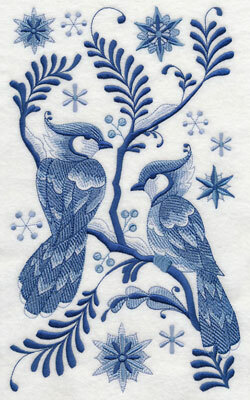 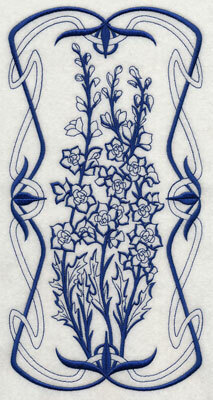 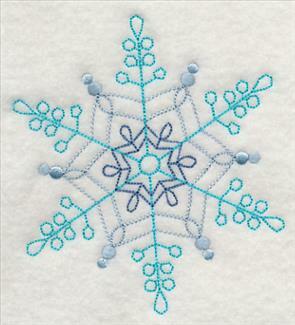 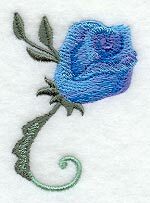 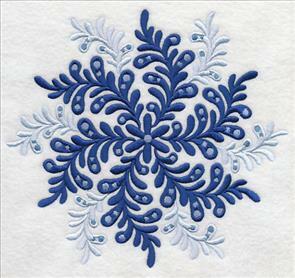 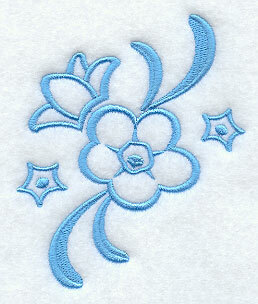 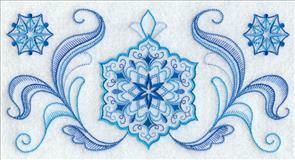 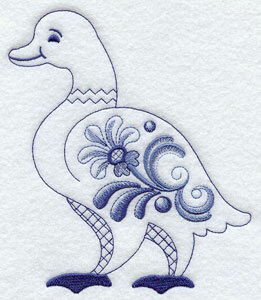 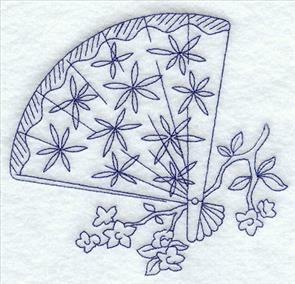 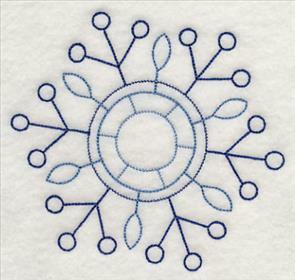 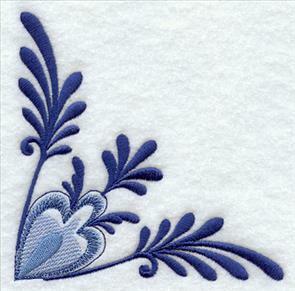 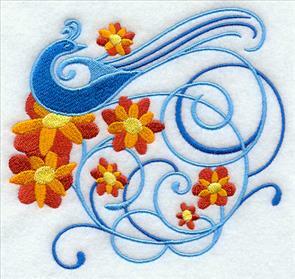 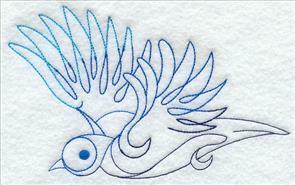 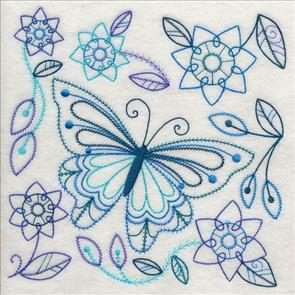 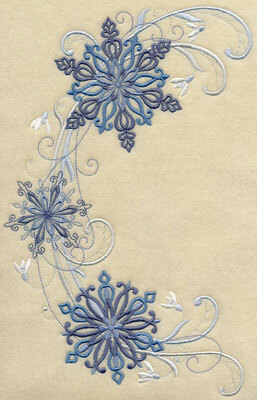 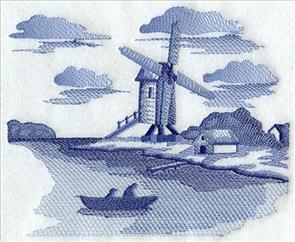 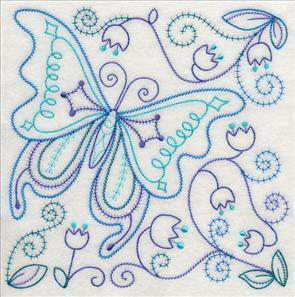 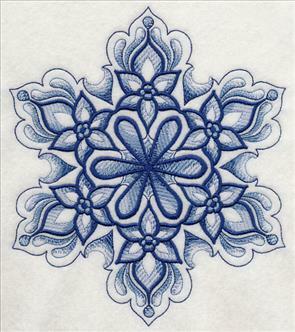 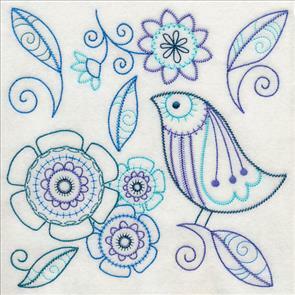 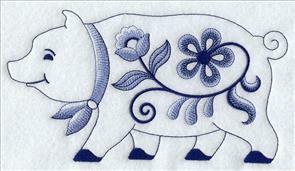 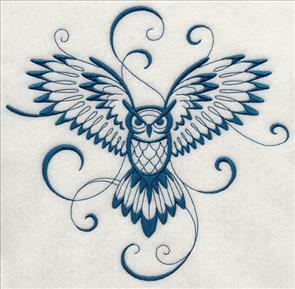 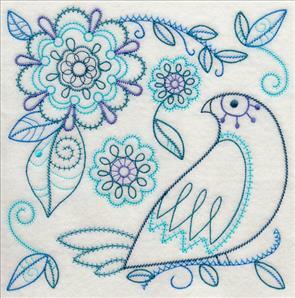 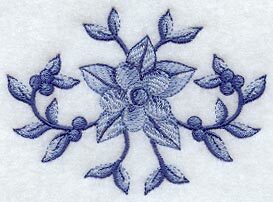 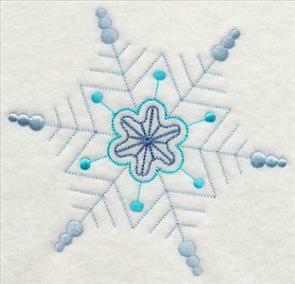 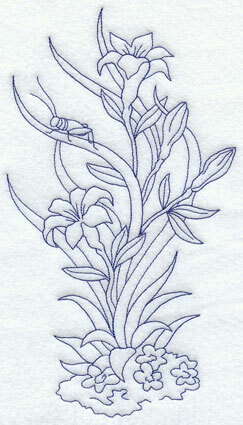 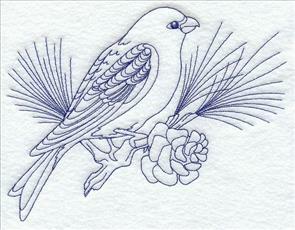 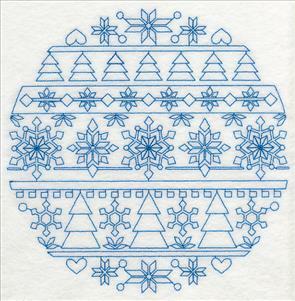 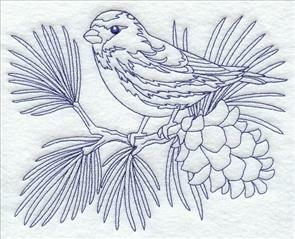 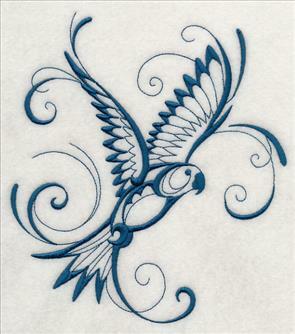 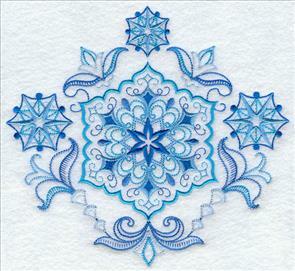 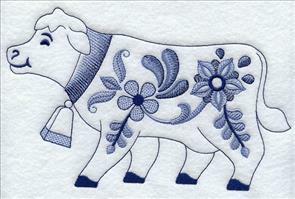 The Scandinavian designs above are all also available in a bluework version. 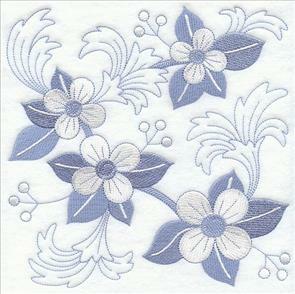 Because these designs are light with open areas showing through, they're particularly nice on low-nap fabrics such as linen, canvas, denim, and twill. 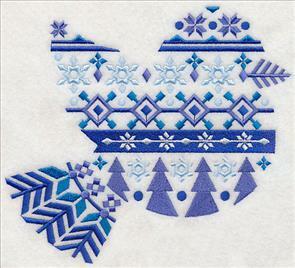 7.80" x 7.43" and 7.24" x 6.90"
6.76" x 7.80" and 6.32" x 7.30"
5.85" x 6.75" and 4.85" x 5.60"
These Nordic bluework motifs use just one thread color, and are a delightfully quick-stitching choice when embroidering. 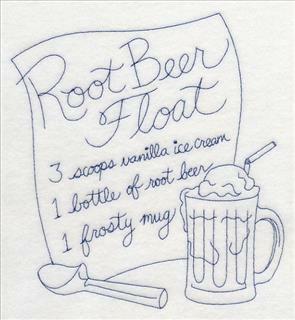 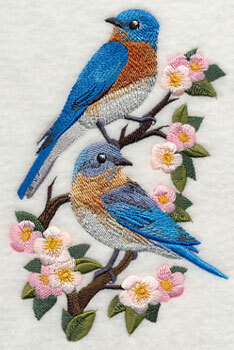 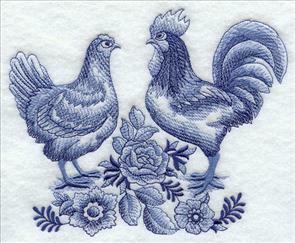 We love them as a set of tea towels, on a pillow, or adorning a quilt! 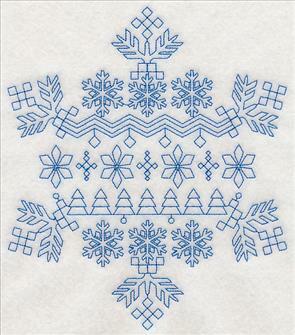 7.68" x 6.88" and 7.14" x 6.40"
7.80" x 7.42" and 7.00" x 6.66"
We stitched these designs in blue for extra frosty flair, but you can easily change the colors to match your project or color scheme. 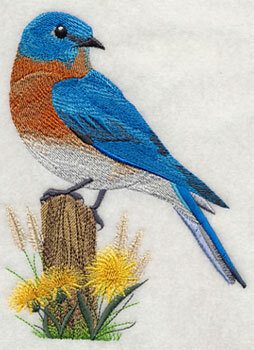 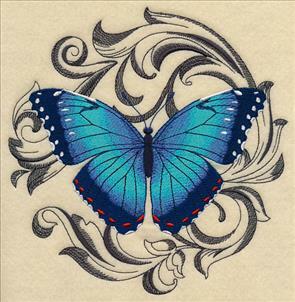 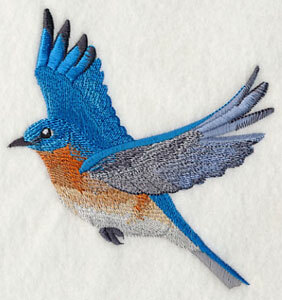 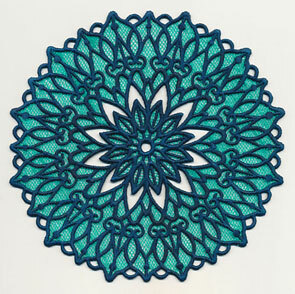 They're a beautiful addition to tote bags, wall hangings, mug rugs, and more. 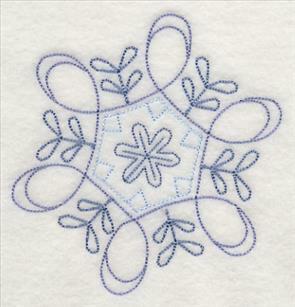 5.87" x 5.85" and 4.86" x 4.84"
Buy all six of the Nordic bluework designs in a pack, or pick your favorite using the individual links above. 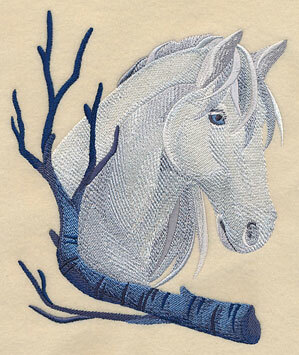 A majestic white wolf and alabaster horse stare off into the frosty landscape in these fabulous features. 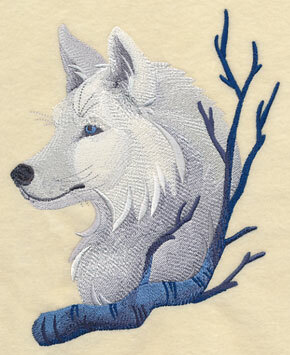 Bare winter branches frame the bottom of the winter wildlife profiles. 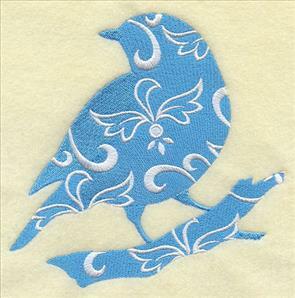 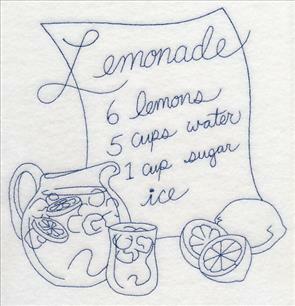 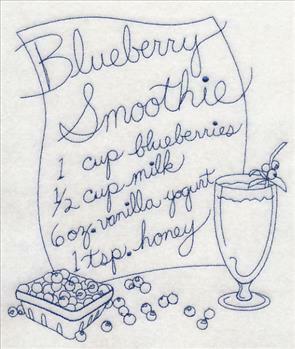 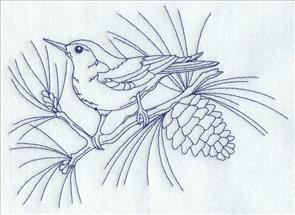 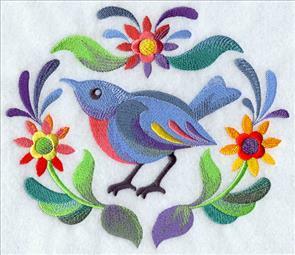 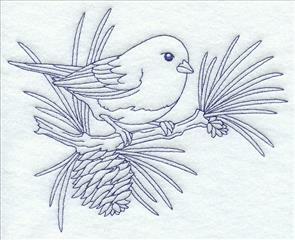 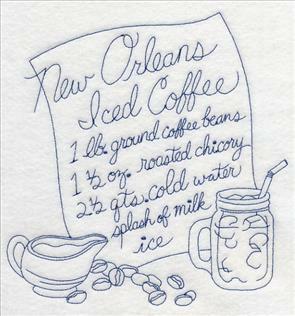 Great for pillows, tote bags, and wall hangings! 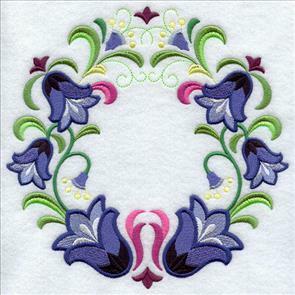 6.44" x 7.78" and 5.85" x 7.06" and 4.86" x 5.87"
These beautiful medallions showcase gorgeous, elaborate detail and patterns in a light and classic vintage stitch. 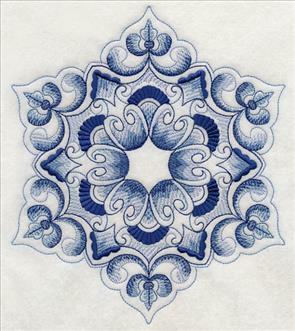 Because the designs are so intricately detailed, the smallest size features a simpler style of the medallions. 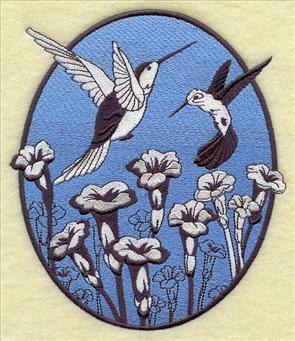 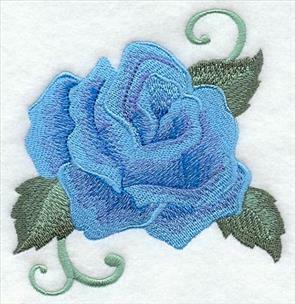 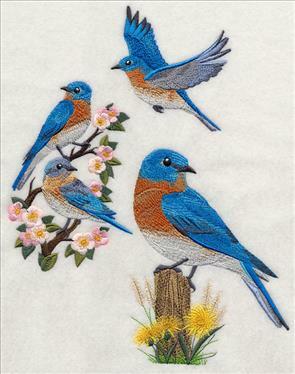 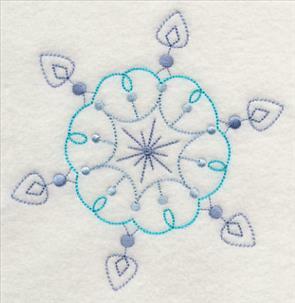 Stitch the larger, more detailed medallions alongside the simpler versions for a complementary look, or pick the design that fits your project and stitch that version alone. 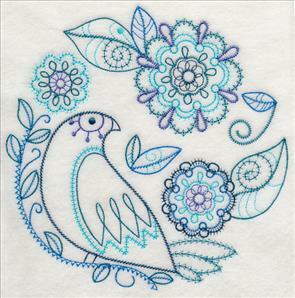 They're equally stunning additions to any project! 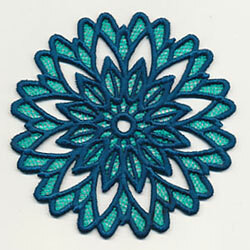 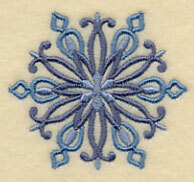 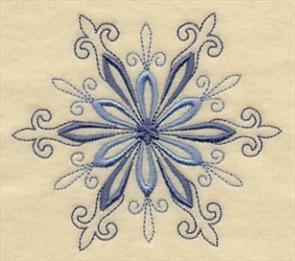 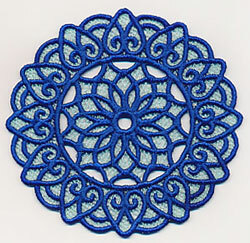 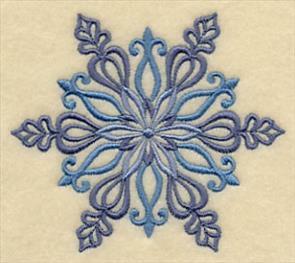 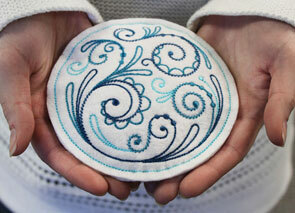 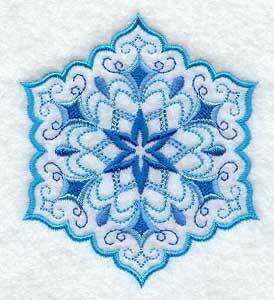 These gorgeous freestanding lace medallions feature two different colors in frosty shades of blue. 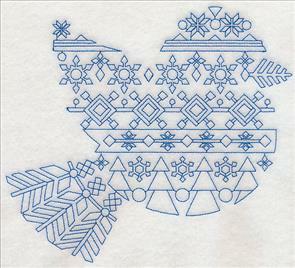 Get the helpful step-by-step instructions for these lace designs here, and find our previous designs here. 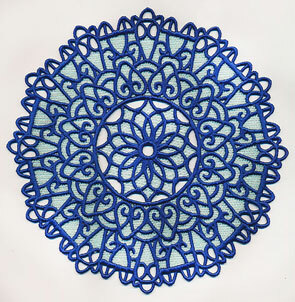 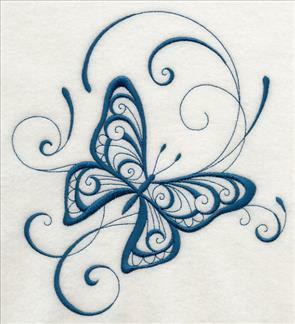 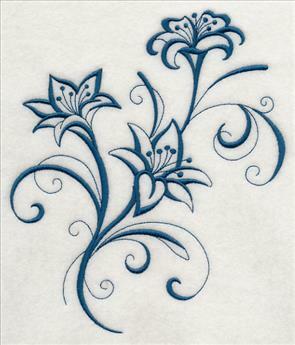 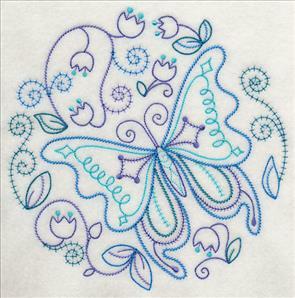 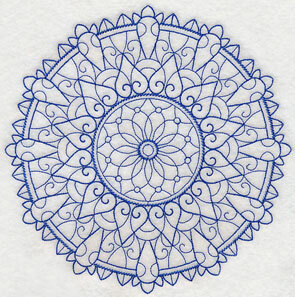 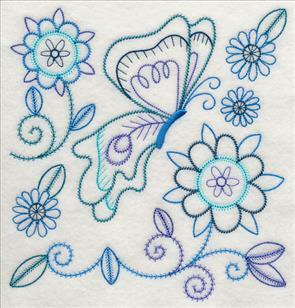 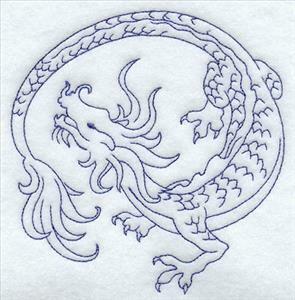 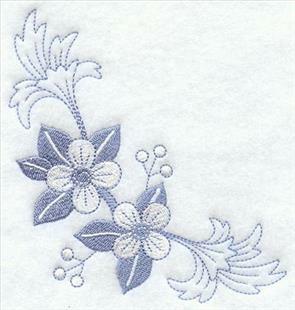 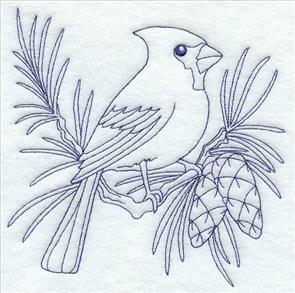 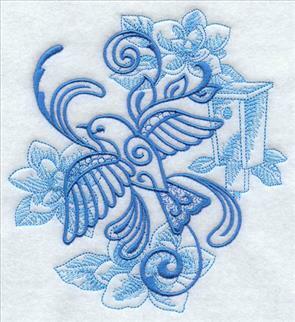 7.78" x 7.76" and 6.92" x 6.90"
Freestanding lace designs are a gorgeous type of embroidery, and can be used in many different projects. 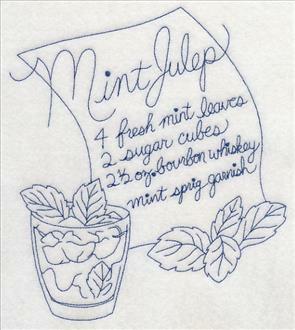 Use them as coasters, sew them onto a pillow, or hang them in the window as a suncatcher. 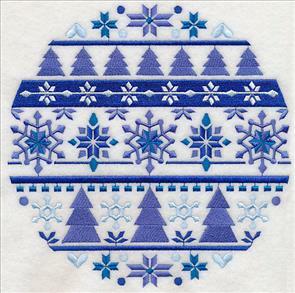 7.76" x 7.78" and 6.90" x 6.92"
Keep your hands warm this winter with a set of in-the-hoop hand warmers! 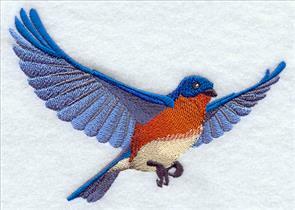 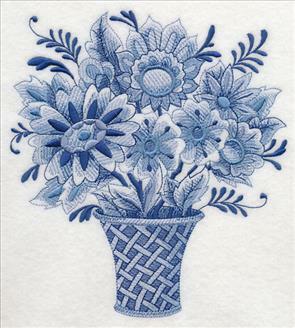 Beautiful blue detail makes these warmers as pretty to look at as they are great to have on hand during the cold season. 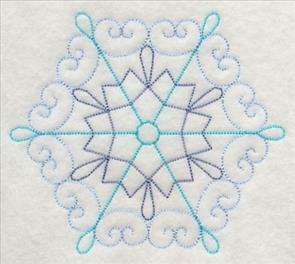 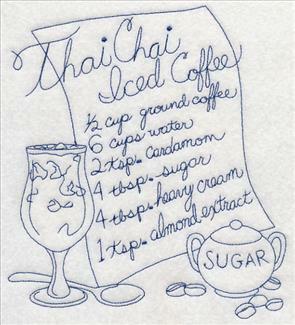 Find the free step-by-step instructions in this tutorial. 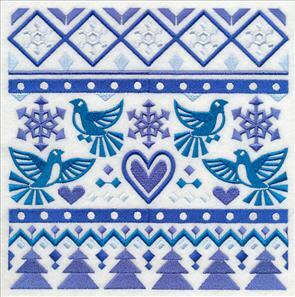 Simply heat in the microwave to keep your hands warm during sports games, winter walks, or trips to the ski hill. 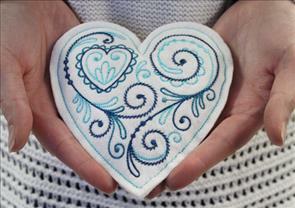 They're stitched almost entirely in the hoop and surprisingly simple to create! 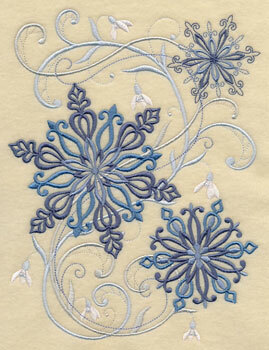 The above designs are brand new, and are fabulous additions to our growing collection of designs. 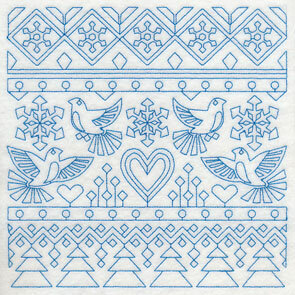 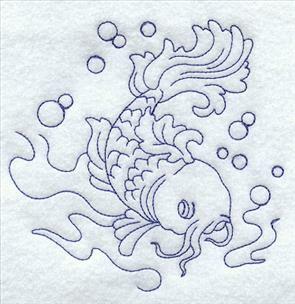 In addition to the new designs, we've added dozens and dozens of other blue-hued designs below. 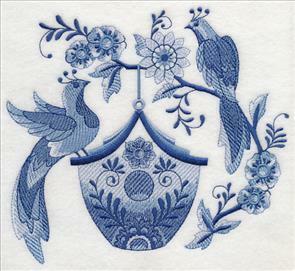 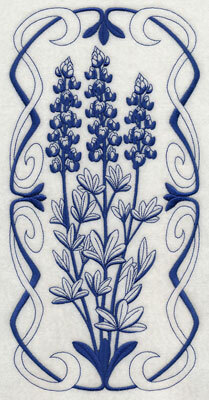 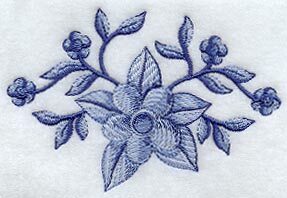 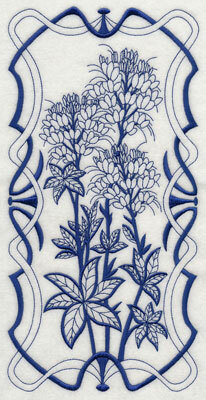 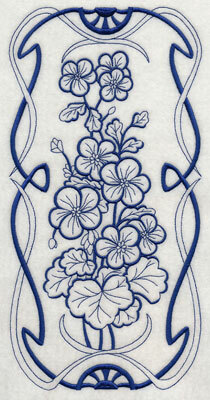 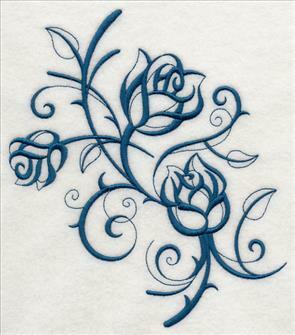 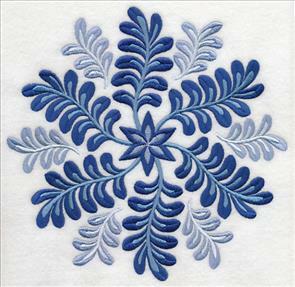 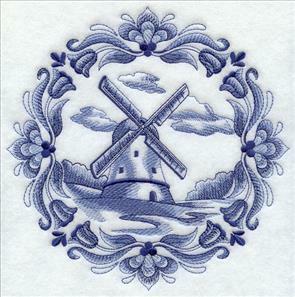 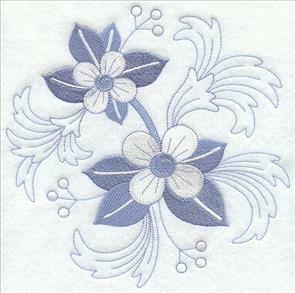 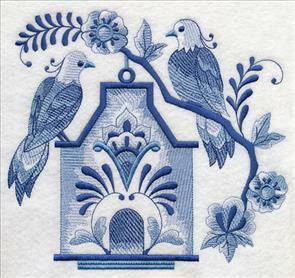 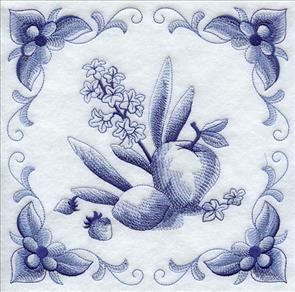 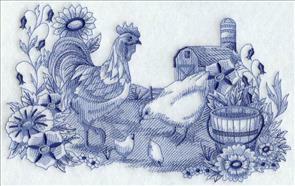 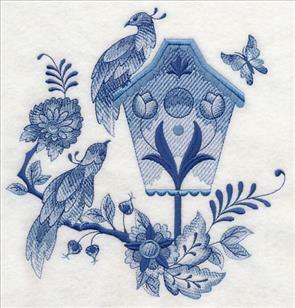 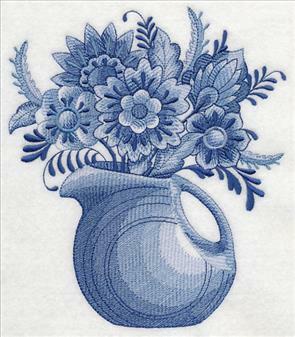 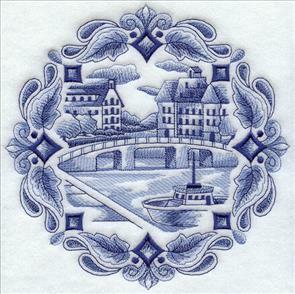 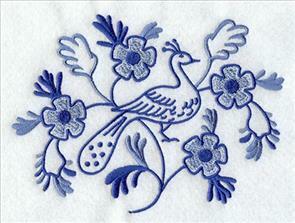 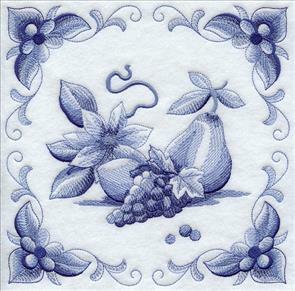 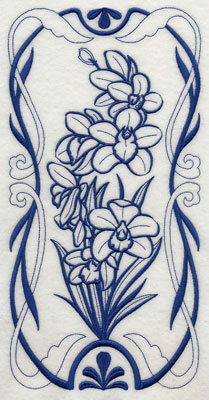 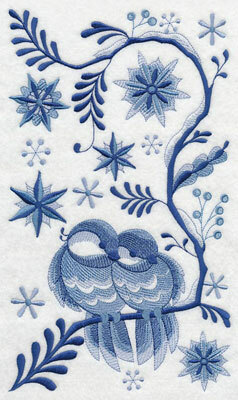 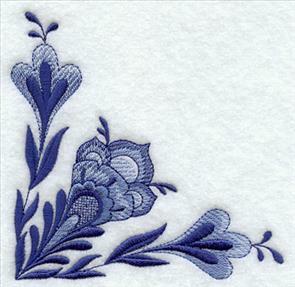 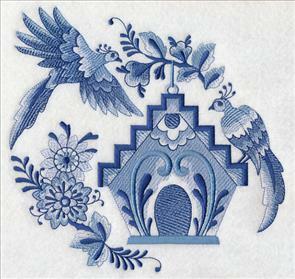 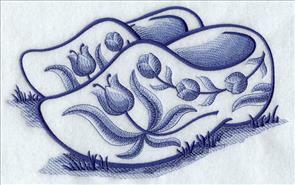 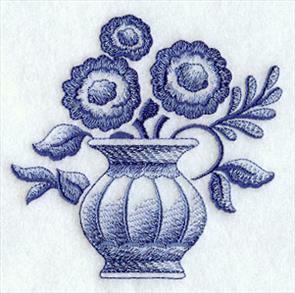 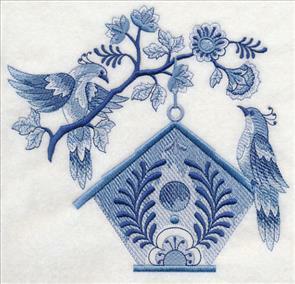 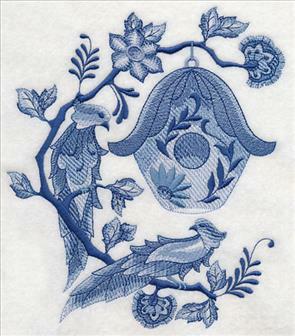 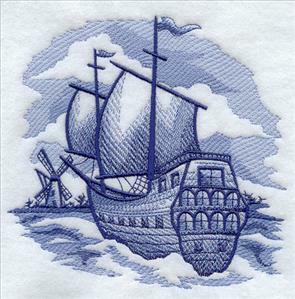 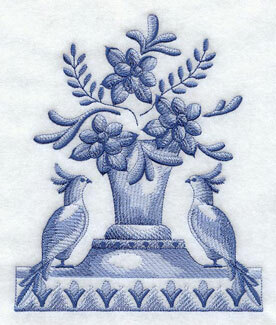 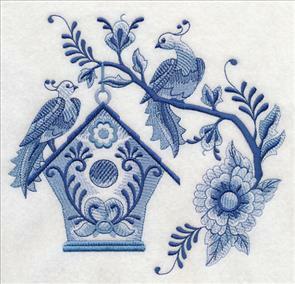 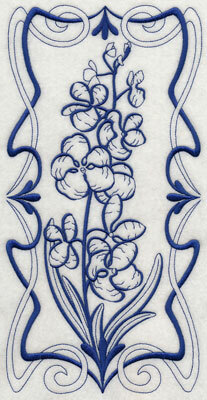 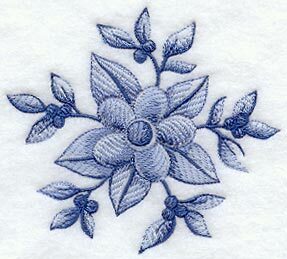 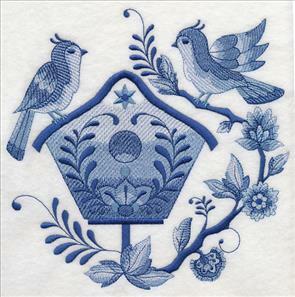 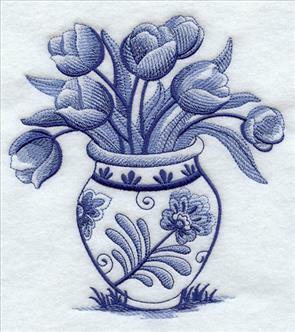 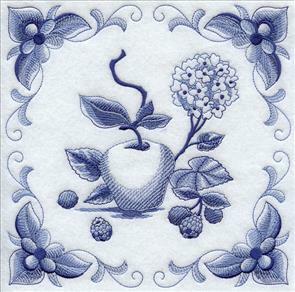 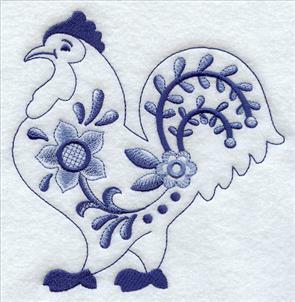 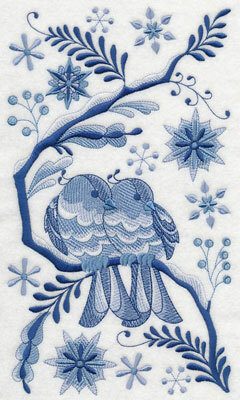 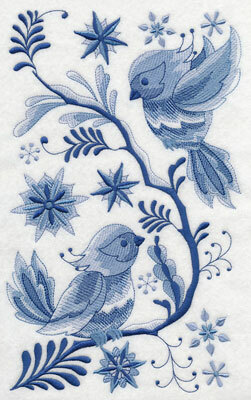 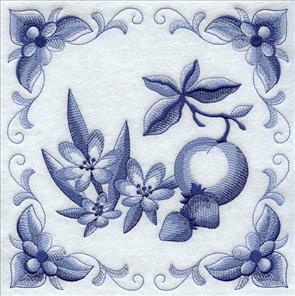 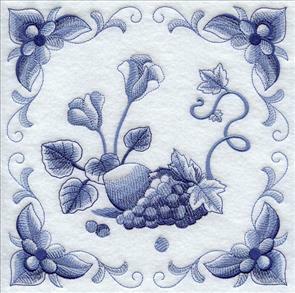 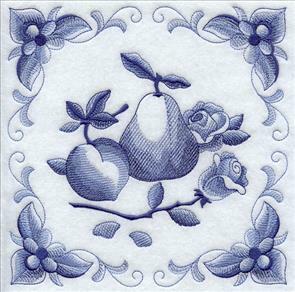 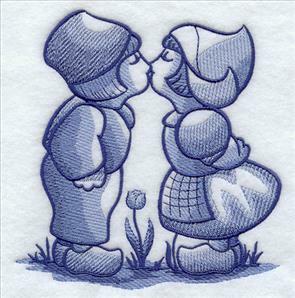 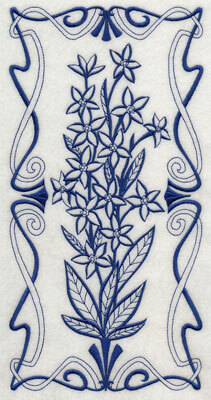 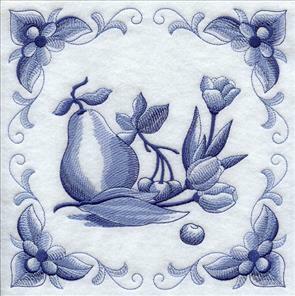 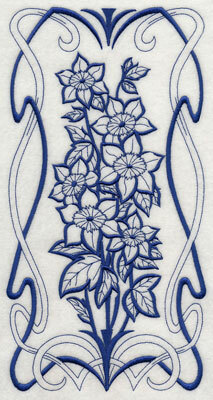 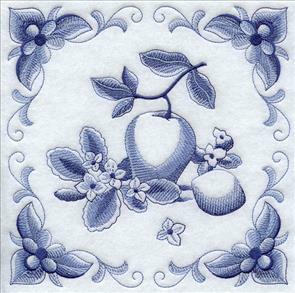 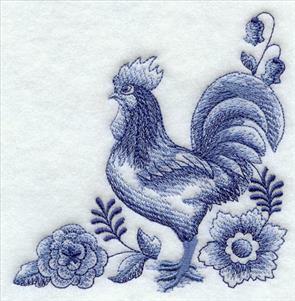 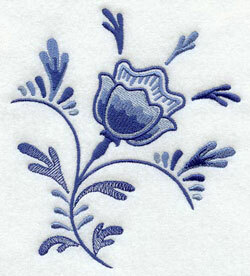 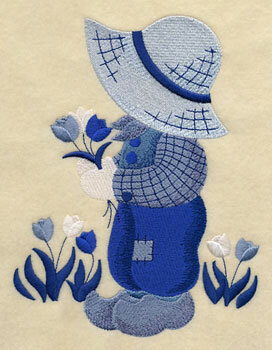 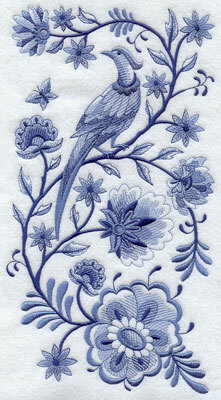 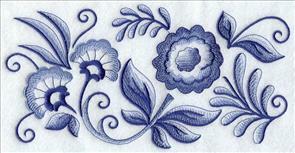 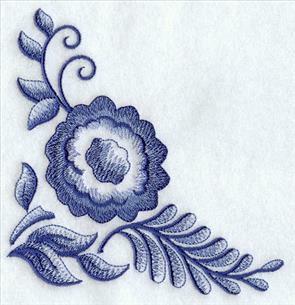 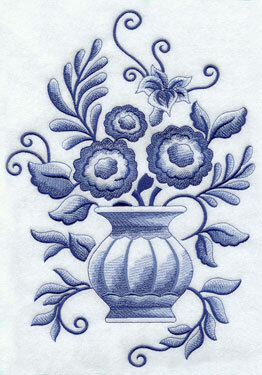 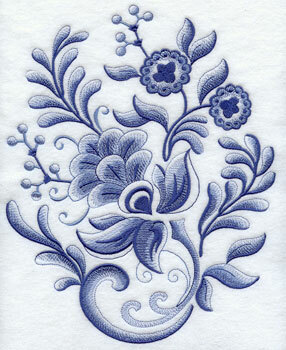 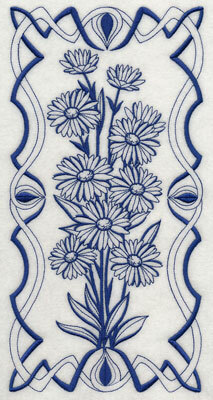 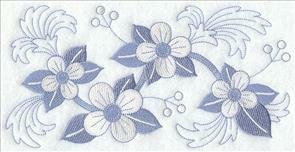 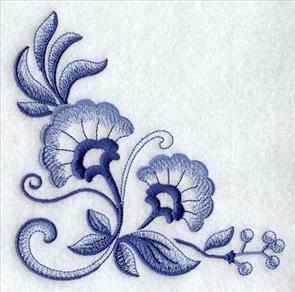 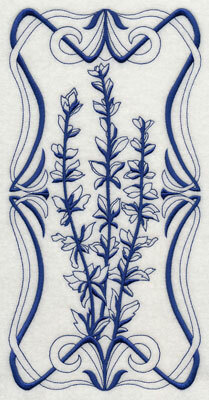 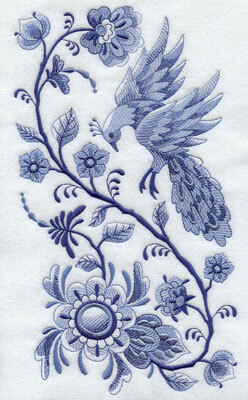 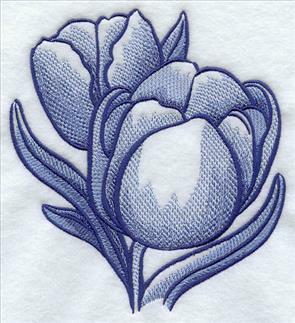 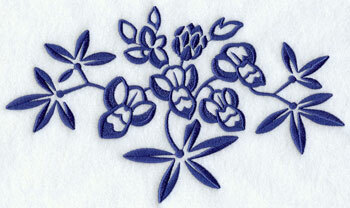 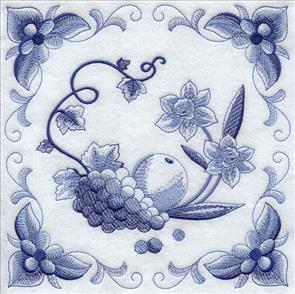 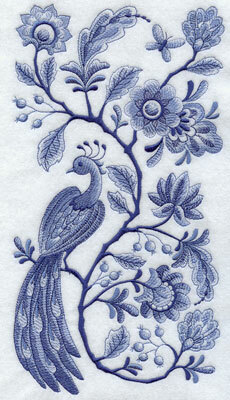 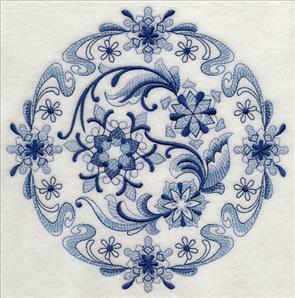 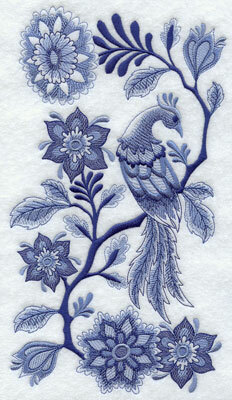 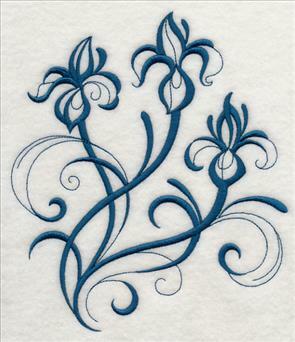 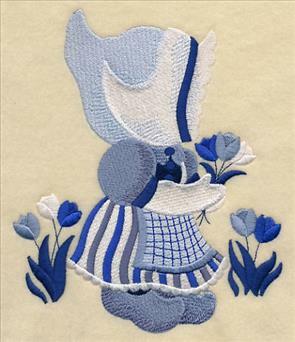 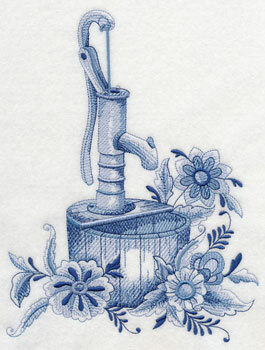 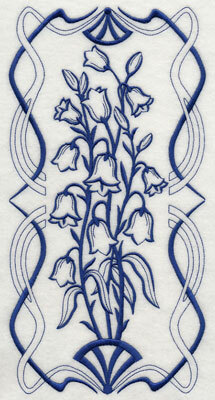 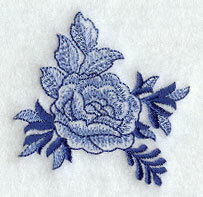 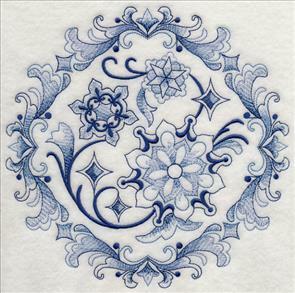 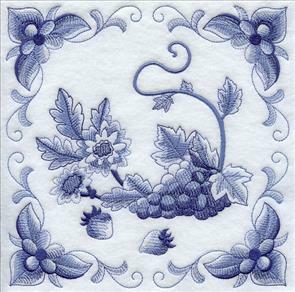 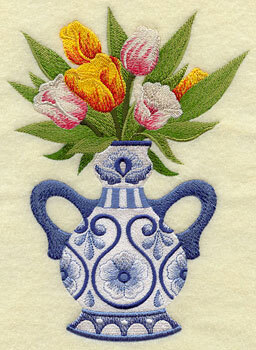 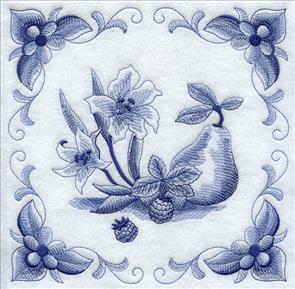 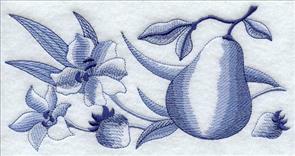 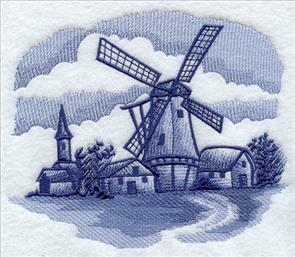 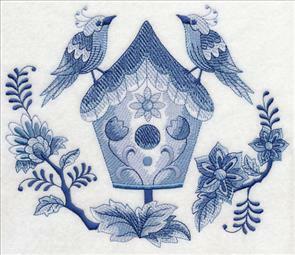 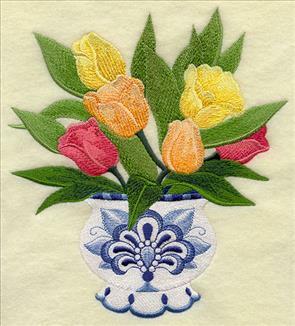 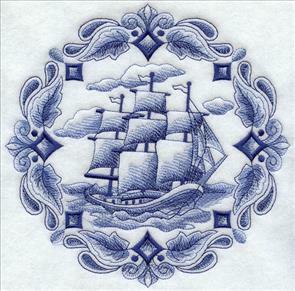 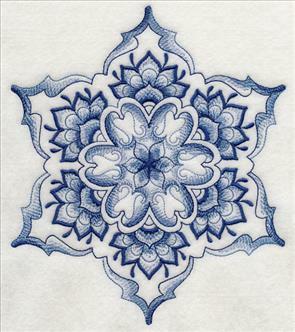 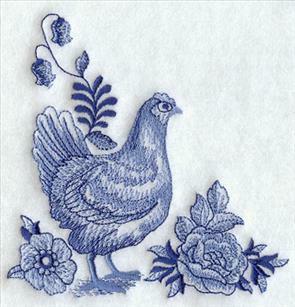 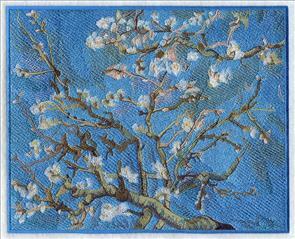 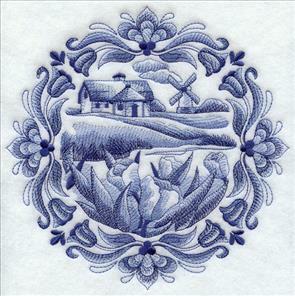 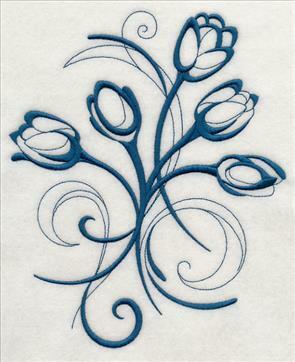 Flowers blooming from delft blue vases are fabulous on pillows and towels. 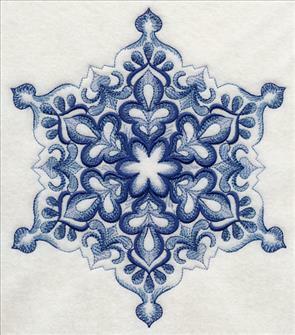 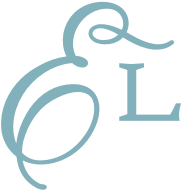 Light bluework designs bring simple elegance to tea towels, and wreaths, sprays, and more are bold and beautiful on any project. 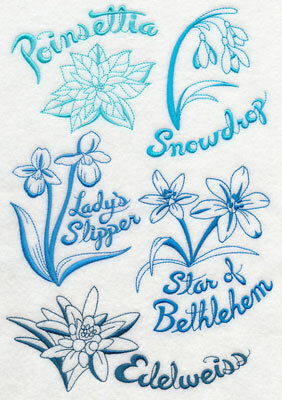 Scroll down to see the variety! 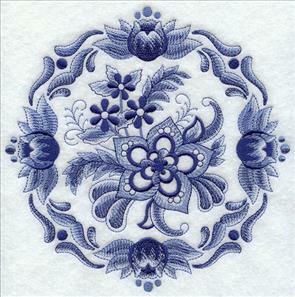 7.03" x 7.81" and 5.81" x 6.45" and 4.86" x 5.40"
6.75" x 7.78" and 5.85" x 6.74"
4.85" x 5.59" and 3.34" x 3.85"
6.80" x 7.83" and 5.85" x 6.74"
6.77" x 7.81" and 5.82" x 6.70"
4.81" x 5.54" and 3.37" x 3.88"
3.86" x 3.36" and 2.59" x 2.26"
3.86" x 3.38" and 2.55" x 2.24"
5.89" x 5.85" and 4.88" x 4.86"
11.74" x 3.93" and 9.42" x 3.15"
7.79" x 2.61" and 6.00" x 2.17"
6.89" x 10.88" and 5.86" x 9.25"
6.91" x 10.02" and 5.86" x 8.49"
5.36" x 7.77" and 4.73" x 6.85"
7.78" x 7.66" and 6.98" x 6.88"
7.79" x 7.18" and 7.48" x 6.90"
9.39" x 4.78" and 7.77" x 3.96"
5.98" x 3.05" and 3.86" x 2.00"
5.54" x 4.88" and 3.88" x 3.42" and 2.53" x 2.23"
4.85" x 5.14" and 3.64" x 3.86" and 2.36" x 2.52"
5.01" x 4.86" and 3.86" x 3.75" and 2.51" x 2.44"
7.21" x 5.85" and 5.94" x 4.85" and 3.84" x 3.15"
6.96" x 5.85" and 5.76" x 4.86" and 3.85" x 3.25"
7.68" x 5.85" and 6.35" x 4.85" and 3.85" x 2.96"
5.85" x 5.85" and 4.85" x 4.85" and 3.85" x 3.85"
5.86" x 6.82" and 4.86" x 5.64" and 3.36" x 3.87"
7.80" x 6.57" and 6.94" x 5.84" and 5.76" x 4.86"
7.80" x 7.60" and 7.09" x 6.91"
7.54" x 7.78" and 6.87" x 7.10"
5.85" x 6.05" and 4.84" x 5.00"
7.78" x 7.65" and 7.00" x 6.88"
7.59" x 6.90" and 6.45" x 5.87"
5.34" x 4.85" and 3.85" x 3.50"
7.80" x 7.27" and 7.40" x 6.90"
6.28" x 5.85" and 5.20" x 4.85"
7.81" x 7.53" and 7.17" x 6.91"
6.10" x 5.88" and 5.04" x 4.86"
7.83" x 7.22" and 6.89" x 6.72"
6.40" x 11.75" and 5.13" x 9.41"
4.25" x 7.80" and 3.72" x 6.82"
5.86" x 6.47" and 4.86" x 5.36"
11.76" x 4.45" and 9.40" x 3.56"
7.80" x 2.95" and 6.00" x 2.52"
7.69" x 7.78" and 6.89" x 6.97"
5.81" x 5.88" and 4.83" x 4.88"
2.82" x 9.40" and 2.07" x 6.88"
9.40" x 2.05" and 6.00" x 1.45"
4.86" x 6.10" and 3.07" x 3.88" and 2.35" x 2.81"
5.40" x 4.86" and 3.86" x 3.45"
5.70" x 3.97" and 3.86" x 2.68"
7.77" x 7.76" and 6.92" x 6.91"
5.82" x 5.81" and 4.87" x 4.86"
7.79" x 6.62" and 6.91" x 5.86" and 5.71" x 4.85"
7.82" x 7.33" and 7.35" x 6.92"
6.24" x 5.87" and 5.12" x 4.81"
9.01" x 4.40" and 6.61" x 3.25" and 3.86" x 1.89"
9.40" x 2.37" and 6.00" x 1.75" and 3.85" x 0.97"
5.85" x 6.39" and 4.85" x 5.28" and 3.54" x 3.84"
2.93" x 3.86" and 2.12" x 2.76"
3.18" x 3.86" and 2.25" x 2.76"
6.86" x 4.25" and 3.86" x 2.39" and 2.51" x 1.55"
7.47" x 7.80" and 6.90" x 7.20"
5.85" x 6.10" and 4.85" x 5.06"
7.35" x 7.80" and 6.90" x 7.32"
5.85" x 6.20" and 4.85" x 5.15"
7.52" x 7.80" and 6.90" x 7.16"
6.69" x 7.80" and 5.86" x 6.82" and 4.85" x 5.66"
5.13" x 4.85" and 3.85" x 3.64"
4.04" x 9.40" and 2.95" x 6.85"
5.24" x 9.40" and 3.77" x 6.78"
7.80" x 7.64" and 7.04" x 6.90"
7.80" x 7.76" and 6.94" x 6.90"
5.89" x 5.85" and 4.89" x 4.85"
5.89" x 5.91" and 4.88" x 4.89"
7.80" x 7.77" and 6.94" x 6.90"
5.86" x 5.90" and 4.85" x 4.88"
7.73" x 7.80" and 6.90" x 6.96"
5.85" x 5.90" and 4.85" x 4.90"
7.80" x 7.63" and 7.05" x 6.90"
5.86" x 5.86" and 4.89" x 4.88"
7.44" x 7.80" and 6.90" x 7.24"
5.88" x 6.17" and 4.86" x 5.13"
5.85" x 5.86" and 4.89" x 4.90"
5.94" x 5.86" and 4.93" x 4.86"
7.80" x 7.74" and 6.96" x 6.90"
6.66" x 7.80" and 5.86" x 6.87"
6.90" x 8.33" and 6.46" x 7.80"
5.86" x 7.07" and 4.79" x 5.78"
4.86" x 5.59" and 3.37" x 3.87"
5.93" x 11.74" and 4.74" x 9.39"
5.96" x 11.75" and 4.77" x 9.40"
3.96" x 7.80" and 3.48" x 6.85"
5.97" x 11.73" and 4.77" x 9.39"
6.19" x 11.75" and 4.96" x 9.41"
4.12" x 7.81" and 3.62" x 6.86"
5.95" x 11.75" and 4.77" x 9.41"
3.98" x 7.80" and 3.52" x 6.89"
5.93" x 11.75" and 4.74" x 9.40"
5.91" x 11.70" and 4.76" x 9.41"
3.95" x 7.81" and 3.47" x 6.86"
5.94" x 11.75" and 4.76" x 9.41"
3.94" x 7.80" and 3.47" x 6.86"
5.92" x 11.75" and 4.74" x 9.42"
5.96" x 11.75" and 4.78" x 9.42"
5.86" x 7.63" and 4.86" x 6.33" and 2.96" x 3.86"
8.57" x 10.70" and 6.91" x 8.63"
6.24" x 7.78" and 5.86" x 7.31"
4.85" x 5.03" and 3.73" x 3.87"
4.77" x 6.46" and 2.71" x 3.66"
10.70" x 8.59" and 8.70" x 7.00"
7.32" x 5.88" and 6.08" x 4.88"
6.24" x 11.69" and 5.02" x 9.38" and 3.67" x 6.86"
6.35" x 11.80" and 5.04" x 9.37" and 3.68" x 6.85"
7.80" x 7.80" and 6.89" x 6.89"
7.77" x 7.77" and 6.89" x 6.89"
5.80" x 5.80" and 4.85" x 4.85"
7.77" x 7.75" and 6.90" x 6.88"
5.84" x 5.83" and 4.85" x 4.83"
9.40" x 3.16" and 5.96" x 2.21" and 3.86" x 1.36"
11.77" x 4.38" and 9.40" x 3.50" and 6.86" x 2.56"
11.14" x 6.97" and 9.36" x 5.87" and 6.85" x 4.29"
7.84" x 9.72" and 6.91" x 8.55"
7.84" x 11.22" and 6.91" x 9.87"
9.40" x 2.38" and 5.98" x 1.57" and 3.86" x 0.98"
9.40" x 5.68" and 6.85" x 4.14" and 3.86" x 2.32"
5.85" x 6.44" and 4.85" x 5.33" and 3.49" x 3.84"
7.20" x 5.85" and 5.95" x 4.83" and 3.85" x 3.15"
4.74" x 4.86" and 3.75" x 3.85"
5.84" x 6.83" and 4.79" x 5.61" and 3.31" x 3.87"
8.00" x 4.99" and 6.79" x 4.23" and 3.85" x 2.41"
4.81" x 5.45" and 3.36" x 3.81"
6.64" x 4.83" and 3.83" x 2.79"
7.80" x 7.72" and 6.92" x 6.90"
5.89" x 5.85" and 4.87" x 4.85"
7.80" x 7.80" and 6.92" x 6.90"
7.74" x 7.74" and 6.89" x 6.89"
5.84" x 5.83" and 4.87" x 4.86"
7.80" x 2.46" and 5.85" x 1.85"
4.85" x 1.53" and 3.85" x 1.21"